It’s hard to believe it’s almost American Thanksgiving. And although I have much to be thankful for, including the ability to play the game I love (even if golf doesn’t always love me back), I’m not all that grateful today as I look out to the wet, cold weather that has settled in to my town (and is expected to make its home here for the next 5 months!) ARG! Thankfully, the world is full of tropical paradises which offer year round sun, surf, sand and sensational golf. I’ve been to at least 7 islands in the Caribbean and although they offer the sun, surf and sand, they can’t compete with the 12+ golf courses that you find on Maui. Not your typical Maui resort course, The Dunes at Maui Lani brings a little bit of Scottish links to the island and packages it into a fun and unique golf experience. My favorite hole on this highly underrated trek is aptly named, “Down the Chute”. With its severe elevation changes, this #1 handicap par 4 gives you a real sense of accomplishment when you can hit the green in regulation. The key to success on this hole is a well-struck, blind drive off a very elevated tee. Sounds fun doesn’t it? A short, wimpy shot will leave you with an impossible downhill lie that will have you begging for mercy. The green seems miles away on your 2nd, tucked away at the end of a fairway that gets narrower with every yard. The bunkers in front of the green are darn right nasty (as are many of the pot bunkers on this course) making your approach shot even more intimidating. Truly a devilish hole, I think #10 is a great beginning to a tough back 9 which winds and twists its way through the alluvial sand dunes back to the club house. I can see having a love/hate relationship with this hole if I played it often. This par 4 hole reminds me of Goldilocks and the 3 bears – it’s not too easy, not too hard, it’s juuuust right! Coming down the stretch on the front nine, this par 4 9th hole offers wide inviting fairways and gorgeous views of the ocean. The designer was very smart when he put this forgiving par 4 right after the hardest hole on the course. I like to call #9 my “instant amnesia hole”. Sometimes you might find yourself walking away from a course saying, “That was fun”. Other times, you might say, “Wow, wasn’t that beautiful!” And sometimes you get lucky and play a course that is both. 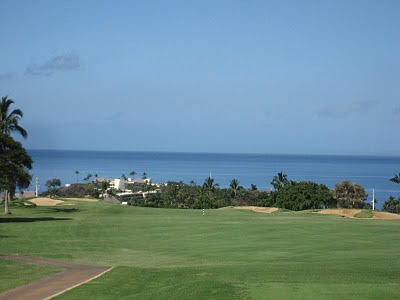 That’s what we found when we played Robert Trent Jones, Sr.’s Royal Course at the Ka’anapali Golf Club. 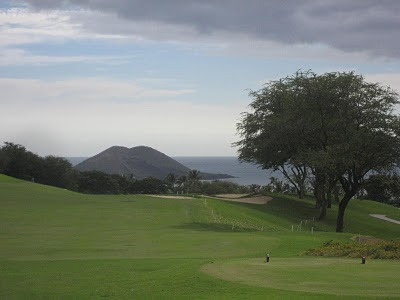 Although there are a lot of great holes on a course which winds its way along the coastline on your front nine, then gives you a completely different flavour of course through the West Maui Mountain foothills on the back, it’s hard to argue with Arnold Palmer who said that the 18th hole was “one of the best and most challenging finishing holes” he had ever played. 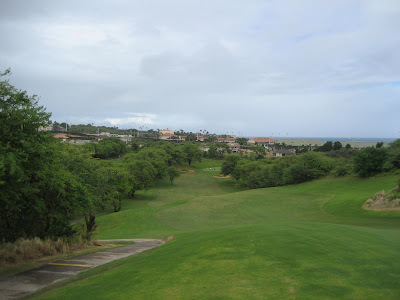 Rated the second hardest hole on the course (some have argued it’s the hardest), number 18 gives you just about everything you could want in a golf hole – lots of length, lots of water, lots of sand, lots of deadly Bermuda rough and lots of challenge. Target golf is the order of the day as you wind your way through the twisting fairway to a green that demands an accurate approach shot. With water to the right and lots of bunkers left and back of the green, laying up on this par 4 isn’t a bad play. Par feels like a birdie on this hole. 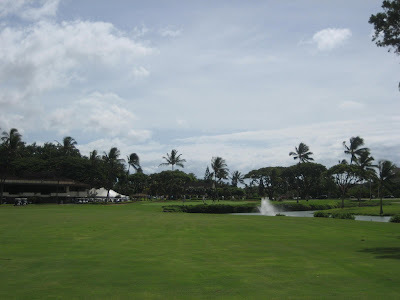 Oh, and if you were a Big Break Ka’anapali fan, you may remember the champion, Kim Welch, survived elimination against Susan and Dana in an early episode on this hole. 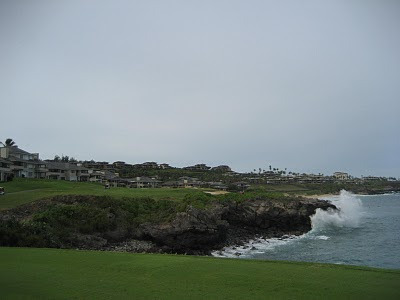 I had a tough time choosing between the 4th and 5th holes at The Bay Course at Kapalua for my top 10. Together these two holes probably make up the most dramatic duo in golf I’ve ever played. The par 4, dogleg 4th snuggles up to the Pacific Ocean, setting the stage for a dramatic entrance to the 5th – a par 3 that leaves you standing in awe at the tee. Pictures cannot do justice to this hole. You have to be there to appreciate its majesty through the feel of the wind on your back, the sounds of crashing of waves on the lava rocks below you and the magnificent views of the southern shoreline that seem to go on forever. A hole that is almost all carry over the ocean, one might be tempted to take an extra club to be safe, but the sneaky Mr. Palmer took that into account in his design, flanking the back of the green with some serious bunkers to punish the overly cautious player. 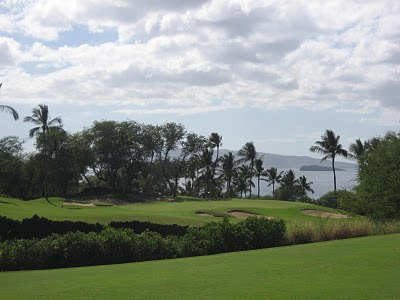 The challenging Gold Course at Wailea is a superb Robert Trent Jones II design and a new favorite of mine. I particularly enjoyed the 8th hole – a short par 3 which offered up breathtaking views of the ocean and distant Haleakala Crater. But don’t let this “visual hazard” distract you. The wind can be a factor here, so club selection is critical. 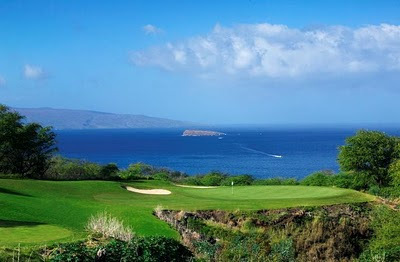 No matter where you stay on Maui, don’t pass up the chance to play the Makena Golf Course on the southern shore. Ka’anapali and Kapalua locals think it’s “way down there”, but for us, the 30 minute commute from Lahaina was well worth the wonderful golfing adventure that awaited us at the end. An award winning Robert Trent Jones, Jr. design, Makena Golf Course is one of those courses you can play again and again and never tire of it. I know there were others playing in front and behind us, but we never really saw them. It was like we were playing on our own island without traffic or any sounds of civilization. And with so many unique holes, full of challenges, this course is beautiful but can also be deadly. The split fairway 6th is a fun risk/reward hole and the two “signature holes”, 7 and 14 are stunning. But my favorite is still the 12th. This relatively easy par 3 serves you up an amazing view of the Haleakala Crater. And in the winter, it’s not uncommon to see dozens of whales frolicking in the waves. Awesome! I know there are probably more than a few “real golfers” on Maui who might disagree with me, but I think Wailea Emerald is arguably the most beautiful course on the island. From practically every hole, there is a vista view that defies description and it’s more women-friendly than some other courses, making it fun to play for golfers of all skill levels. The view of Mt. 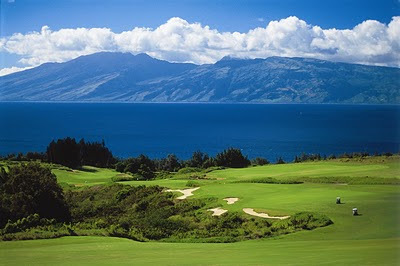 Haleakala as you head downhill towards the green on the reachable par 5 18th is the screen saver on my laptop. I never tire of looking at it and dreaming of my next “come back tomorrow shot”. I have yet to play this hole well, but it never fails to make my heart race a little faster as I step up to the tee and think, “Maybe this time…”. The 18th green is reachable in two by the longer hitters and it was a lot of fun watching our playing partner do exactly that. It’s not a difficult hole according to its rating (#8), but it does bite you if you’re not careful. Keep it right off the tee and you’ll be okay. Get greedy and try to cut off the dogleg and double bogey could easily be in your future. 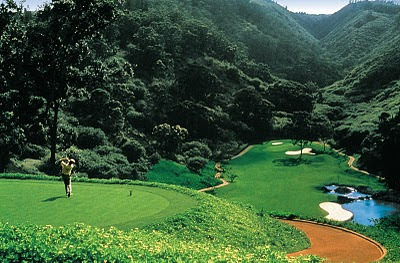 Okay, so Lana’i shouldn’t technically be allowed in a Maui top 10, but I’m going to take some poetic license and include my favorite holes on this island paradise so that readers don’t miss out on two of the most memorable golf courses on the planet. The Experience at Koele’s signature hole has an elevation drop of 250 feet that is nothing short of terrifying and exhilarating at the same time. It was very hard to take a picture of this hole, so I’m using a photo from Four Seasons Resorts Lana’i. It’s the second hardest hole on the course, but without a doubt, the most fun to play. We first passed by the hole on the way down from the practice facility early in the day. No one was playing at the time, so we belted a few out onto the fairway just to experience the rush. But even that wasn’t enough. When it came time to play the hole for real, we both walked up with 3 balls in our pockets. Gripping it and ripping it has never been more thrilling! When I was putting together this top 10, I had a little trouble deciding the order of some of the holes as I loved many about the same, until I came to #1 on my list. 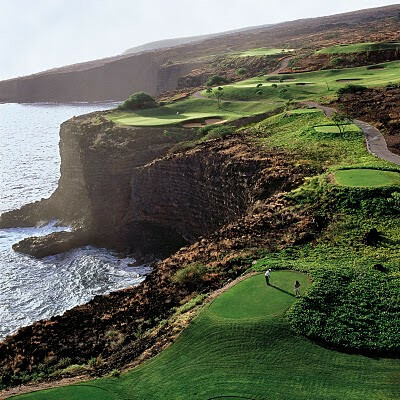 The 12th hole on The Challenge at Manele is by far the most spectacular golf hole I have ever seen, let alone, played. Once again, I couldn’t do justice to this with my camera, so this shot is courtesy of Four Seasons Resorts Lana’i. Yes, Maui feels like my home away from home and I plan to return every year to play these holes over and over again. I’d love to hear about your favorite holes on your favorite courses. I’m always looking for best places to play to add to my bucket list.